Well.. I bit the bullet, jumped on in, took the plunge, whatever you want to call it. I finally decided it was time to start documenting our home adventures. Just about one year ago, we closed on our first home, May 31st to be exact. We moved in on August 6th 2011, the day before our one year anniversary. That next morning we woke up on our mattress in the dining room desperate to find a box with some clothes that we could wear to church. It was a seriously amazing gift for our first anniversary. We pretty much spent our whole first year saving, stalking realtor.com, looking at houses with our realtor, and deciding what we really wanted for our first home. When we walked in to what would be our house the first thing that popped into our mind was OLD. You know.. green carpet, yellow kitchen, pink bathroom. But looking past the old, it was clean, it was sturdy, and we fell in love. It was SO different than so many foreclosures that we had looked at. You could tell the owners loved their home and their pride in the home showed by the way they took care of it. We walked around visualizing what we could do to update the house and make it ours. We put in an offer, and God answered our prayers.. among multiple bidders we were the chosen ones! We went in knowing that we had tons of updates ahead of us, but we could update it how we wanted! The condition of the house was exceptional, so we didn’t have to worry about putting money into those types of things. So here’s to catching up on our first year in the house and continuing on in this journey of making our house our home! 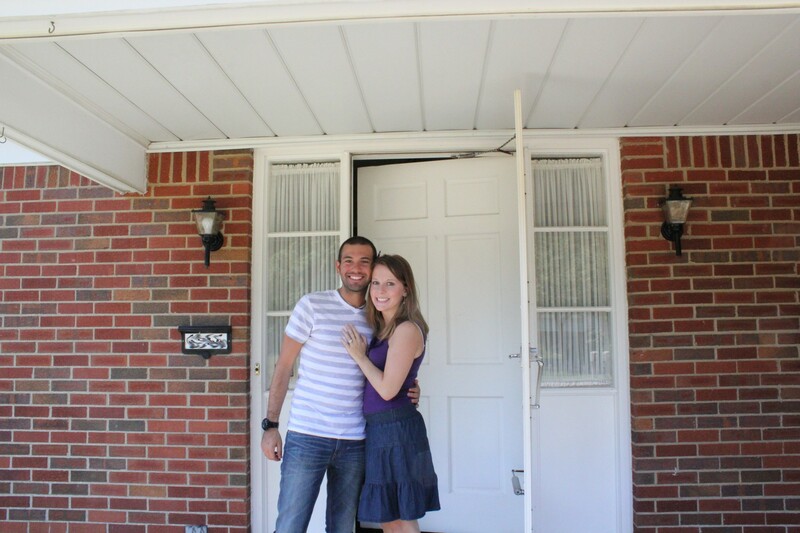 And for your viewing pleasure, here’s Josh & I right after we picked up our keys walking into OUR house for the first time!